If I had to sum up my reading this week in 15 words or less: More Moriarty, you get what you give, and a kiss before dying. 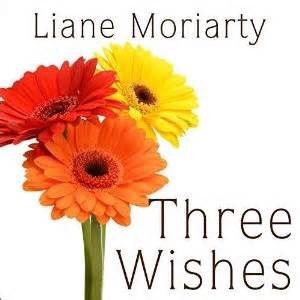 Three Wishes by Liane Moriarty is a tale of triplets. Two are identical, one fraternal. And at thirty-four years old, they still act like children, unable to settle disputes without anger, sometimes violence, which is how the pregnant sister ends up with a fork in her stomach at dinner, the dagger thrown by one of her sisters because of something she’s said or done.I’ve always been fascinated by the idea of twins but I don’t personally know any triplets and this book makes me kinda glad I don’t. For the past few weeks, I’ve been reading as many of Liane Moriarty’s novels as I can get my hands on. This is my fourth. Remember, last week I talked about some of the commonalities in her books. Three Wishes was her debut novel and in it, I could see glimpses of the great writing I admire in her recent books, like The Husband’s Secret. But Three Wishes is not as refined as the later books. In it, Moriarty uses the same technique I’ve come to expect from her, where she switches between narrators, with all three women getting a chance to tell their story from their own point of view. Three Wishes was a great opportunity to see a successful writer starting out, even if it wasn’t her best work. Solid 3.5 stars for this book. I Take You by Eliza Kennedy: Lily is a twenty-something Manhattan lawyer is engaged and planning to marry her Met- museum archeology expert fiancé, in less than a week in Florida. Except there’s a client waiting for her in Florida that her boss insists she has to depose while she’s there. She has more step-parents than should be allowed and none of them seem to know anything about parenting. Then there’s the reason she hasn’t been back to Florida to visit since she left as a teenager. Why is she even going back there to marry someone no one in her family has even met? I wanted to take a shower after reading some parts of this book. Lily is not someone I would like to know in real life, not just because she does whatever she wants to with no regard for the people around her, but more so because she’s a hypocrite who calls out people for doing the same to her. I would have stopped reading this book except I had said I would finish it. But I never promised I would recommend it to anyone. I’ve since heard that some celebrity bought the rights to the book and it’s going to be made into a movie. Lily is just the kind of messed up character Hollywood loves. However, I’m not Hollywood. 2.5 stars for this book, not because the writing was bad, but because there wasn’t any character I liked. None. And there were many to choose from. 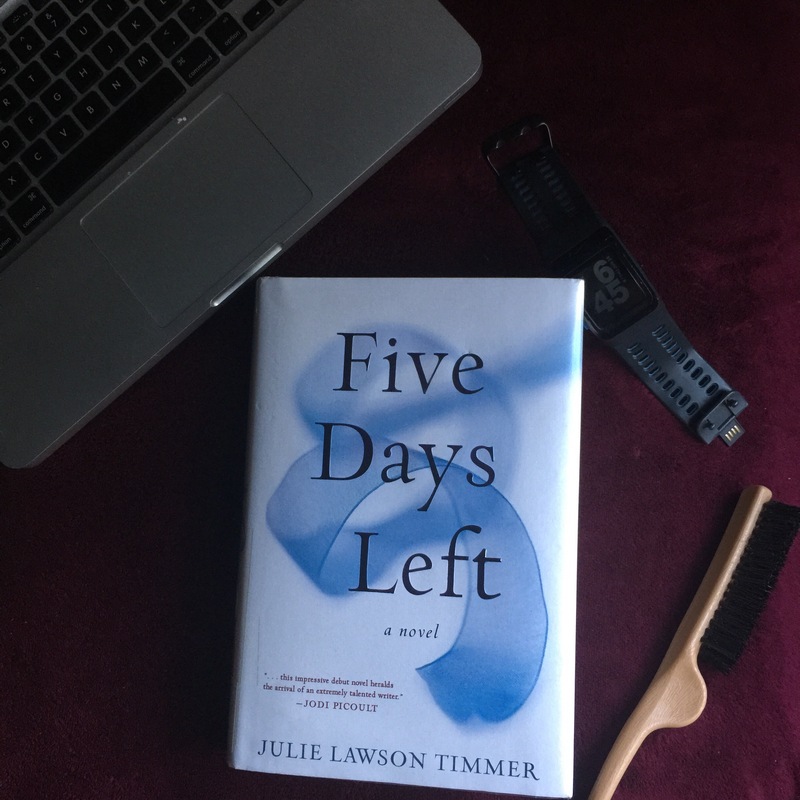 Five Days Left by Julie Lawson Timmer: Mara is five days away from her birthday but four years ago, she found out she has Huntington’s Disease and it’s progressing to the point where she’s losing control of her body. Involuntary movements, incontinence, inability to walk straight. She’s only forty-one. But if nothing has changed by her birthday, she’s planning to kill herself to spare her husband and adopted daughter the burden of having to deal with her. In the meantime, she’s making lists of all the things she has to do by then and saying goodbye to everyone she knows. Scott is a foster dad whose wife is pregnant with their first biological child but he’s more excited about the kid living with them than the one they’re expecting. In five days, their foster child is set to go home to his mother who’s finally being released from jail. And while his wife is relieved to be getting her old life back, Scott is dreading what’s about to happen. Mara and Scott are friends online through a parenting chat room and although they don’t know each other’s identities, they encourage each other in ways the people in their real lives don’t. The initial plot setup was interesting. Uniquely so. And I learned some things about HD that I didn’t know before. But the book failed in its delivery. Maybe I was too tired, staying up until morning to finish this book – not because it was so good but because I so wanted it to be over. After a while, I didn’t want to know these characters any more. Mara’s story was an unwinnable one; so is Scott’s. In both situations, one person has to be selfish and the others selfless. Does it matter if you convince yourself that your selfishness is really for the good of someone else? I kept expecting Mara and Scott’s lives to collide in a more meaningful way – I was disappointed until the very end. The auxiliary characters remained just that and there was no real development in their roles. The book switches between their stories, both in 3rd person narratives, although we only get to see what Mara and Scott feel and think. The resolution to Scott’s story felt a little forced and even the delivery of the best news under the circumstances feels like an anticlimax. 3 stars for this debut novel. The author info said she’s working on a second novel. Hopefully, she will improve with each book she produces, like Moriarty did. Have you read any of the books? Hated any of them too? What are you reading these days? I’ve only read one of Moriarty’s books so far but I loved it and want to read more! I requested all her books at the library. I have two more, What Alice Forgot and The Hypnotists Love Story. Then I’ll have to wait until she publishes something else. Although her sister is a novelist too and I’m thinking about comparing their works to see if there are similarities. Thanks for stopping by my blog! I’ve only read one of Moriarty’s books (The Husband Secret) and I really enjoyed it. I’ll definitely pick up more of her books in the future, and I’ve heard that What Alice Forgot is one of her best! You did say you would return the favor if I left you a comment. Thanks for making good on your promise (sometimes it’s s challenge keeping up with that). I am simultaneously enjoying my little Moriarty phase and dreading the day when I would have finished reading all her books and will have to move on. I am loving “What Alice Forgot” so far. I love reading your reviews. I never read books any more, except Self help/improvement and even then I prefer to find the audio version and get it over with in a few hours. I love that you read so much. My 10 year old reads more than I do. Three Wishes: I know a set of triplets (1 boy, 2 girls – not identical) and they are fantastic. I Take you: Did you feel that the characters were at least realistic? Could you see them in people who you interact with? Five Days Left: Doesn’t sound like something I’d be interested in either. I have definite reading phases but I don’t go too long without wanting to immerse myself in a great novel.